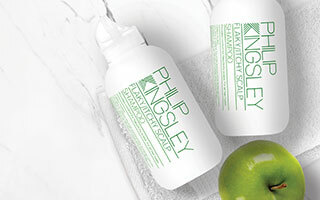 Written by Philip Kingsley Trichologist, Zoe Passam. You may be aware that iron is an important mineral for hair, but it is interesting to know why this is the case. When we talk about the significance of iron in relation to hair, we are specifically referring to ferritin, the name given to the amount of iron stored in our bodies. Often patients will come to us for consultation having already had blood tests, and been told their iron level is ‘normal’. There are two points to note here; firstly, the doctor may have simply tested the iron and not the ferritin, and secondly, even if the ferritin is within the ‘normal’ range, the level may still not be adequate for optimum hair growth. A person can have a low ferritin level without being anaemic. A ferritin reading towards the lower end of the range will almost certainly have a detrimental effect on the hair. This is because it has a direct effect on the hair growth cycle. Hair follicles do not continually produce hairs throughout our lifetime, but rather they go through phases of growing a hair and resting. 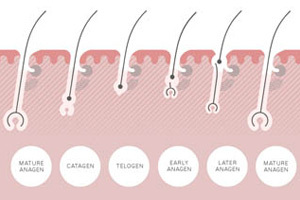 When a follicle is in the ‘growing’ phase, this is called anagen, and when it is in the ‘resting’ phase, this is called telogen. On average, a hair will grow for 5 years before falling out and being replaced. If we do not have sufficient stored iron, the duration for which an individual hair grows will be reduced. Hair loss due to low ferritin is one of the most common types of hair loss we see in women. Rarely men can be affected too, but it is menstruating women who are most likely to be affected, as blood loss depletes iron stores. Patients presenting with this type of problem will usually complain of shedding too much hair. Normal daily hair loss can be as much as 80-100 strands per day, but crucially, an increase in what is normal for you is the most important factor. Sometimes patients with low ferritin will complain that their hair ‘won’t grow’. In reality, there are very few situations where the hair actually doesn’t grow, and women with coloured hair may observe their ‘roots’ showing, even though their hair does not appear to be getting any longer! What is actually happening is that because the anagen phase is reduced, the hair cannot grow as long as it usually would, as it falls out prematurely, without reaching its maximum length. At the extreme end of this, a person may observe some quite short hairs sticking up, and believe their hair is breaking off, but to the experienced trichologist, these hairs can easily be differentiated from breakage. The good news is that hair loss due to low ferritin is entirely reversible, and relatively easy to correct. Once the ferritin level has been ascertained by means of a blood test, the trichologist will be able to recommend the best level of supplementation for that individual, based on their personal history. Whilst it is helpful to include iron rich foods in the diet, such as red meat, dark green vegetables and dried apricots, if a person has a known deficiency, supplementation will be necessary in order to take in enough iron to raise the ferritin level. The patient will then be closely monitored over a period of months, and the supplement adjusted as necessary. (Iron supplements should only be taken on the advice of a specialist, following appropriate blood tests).